1. Preheat the oven to 180°C, gas mark 4. Line a baking sheet with greaseproof paper, arrange the ham slices in a single layer, then cover with another sheet of greaseproof paper. Lay a second baking sheet on top, and bake for 10 minutes until crisp. Leave to cool, then break the ham into bitesized pieces. 2. Meanwhile, heat a large pan of water to a gentle simmer, carefully crack the eggs individually into the pan and poach gently for 4-5 minutes, or until cooked to your liking. Drain thoroughly. 3. 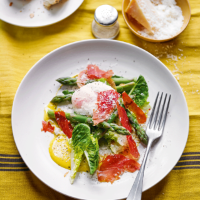 While the eggs poach, blanch the asparagus in a separate pan of boiling water for 3 minutes until tender. 4. Whisk together the mustard, oil and vinegar in a large bowl. Season well with black pepper. Add the asparagus and washed lettuce leaves, and toss to coat. Divide between four plates, topping each with an egg and crispy ham. Sprinkle with Parmigiano Reggiano and serve.